Temporary Closure – Borges-Clarksburg Airport Closed | Executive Flyers, Inc.
Borges-Clarksburg Airport Closed To All Traffic! Effective February 16, 2015, Borges-Clarksburg Airport closed to all aircraft operations, including “low approaches” and simulated forced landings at the Airport, to ensure the safety of ground personnel and aircraft operators. 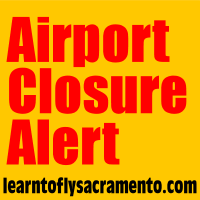 As the authorized representative of the Borges-Clarksburg Airport, a “private” airfield located approximately 5 miles south of Sacramento Executive Airport (“SAC”), I am requesting the assistance of local FAA Designated Pilot Examiners in notifying pilots, flight instructors and other airmen of the “Temporary Closure” of Borges-Clarksburg Airport. In the past, pilots from Executive Airport and other nearby airfields have occasionally utilized Borges-Clarksburg Airport for training and testing to include practice “low approaches,” sod field “touch & go” operations, and short-field landing and takeoff maneuvers. Until such time as runway maintenance and other actions are completed, please inform your associates and student that Borges-Clarksburg Airport is “Temporarily Closed” until further notice.